Unlike Sri Krishna who always supported Pandavas, Balaram, the elder brother of Krishna, supported both Pandavas and Kauravas. But once Duryodhana, the eldest of the Kauravas, insulted the Yadavas – the clan of Balarama. The Kauravas on that day realized the true power of Balarama as he showed them his giant form and what he is capable of doing. Balarama’s daughter Vatsala loved Abhimanyu, son of Arjuna. But Balaram fixed her marriage with Duryodhana’s son Lakshman. Sri Krishna with the help of Ghatotkacha, son of Bhima, got Vatsala and Abhimanyu married. Duryodhana considered this an insult and decided to break an already fixed alliance between his daughter, Lakshmani, and Samba, son of Sri Krishna. Samba was not ready to accept this and he sneaked into Hastinapura, the capital of Kauravas, and tried to usurp with Lakshmani. But he was caught and put in prison. Balarama who came to know about this incident went alone to Hastinapura and asked Duryodhana to release Samba and conduct the marriage as fixed earlier. Duryodhana rebuked Balaram for supporting Samba and start insulting the Yadavas. Blinded by anger, Duryodhana uttered insulting words on Balarama forgetting that he is the only ally of Kauravas among Yadavas. 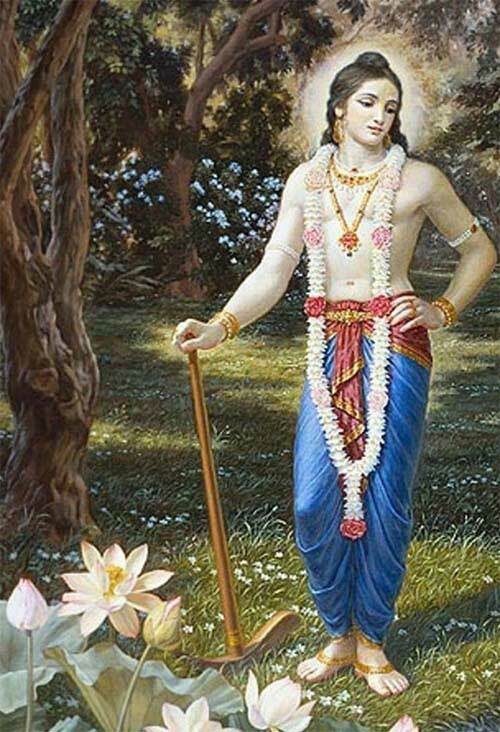 He forgot that it was Balarama who taught him the tricks of using mace efficiently. Balarama had always helped the Kauravas. This angered Balarama and He took a giant form – Duryodhana and other Kauravas could not see the head of Balarama. His head reached the sky. His arms were like huge trees. Legs like mountain peaks. He then swung His giant plough and started moving Hastinapura towards the sea. Soon Duryodhana realized that Balarama was no human. Duryodhana now saw a never seen image of Balarama. He did not want Balarama too to side with Pandavas. He immediately released Sambha and conducted the marriage as decided. Balarama is quick to get angry but he is also pacified easily. He forgave Duryodhana and returned to Dwarka with the newly married couple.